The 2017 U.S. Women’s Open, Presidents Cup highlight long list of great golf events, venues. Spring is in the air, which means a new golf season is just around the corner. And for the best golf of 2017 — whether to watch it or play it — the place to be is New Jersey. The world’s best men and women tour professionals return to New Jersey this summer for two elite competitions – the U.S. Women’s Open Championship at Trump National Golf Club Bedminster on July 13-16 and the 2017 Presidents Cup, pitting Team USA Team vs. 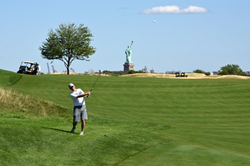 Team International on Sept. 29-Oct. 1 at Liberty National Golf Club in Jersey City. These two world-class events are just the latest to be hosted in New Jersey. Last year the fourth and final leg of the men’s major championships, the 2016 PGA Championship, was played at famed Baltusrol Golf Club, in Springfield. And there is a lot more historic golf on the way to New Jersey: The Barclays, part of the PGA TOUR’s FedEx Cup Playoffs, will be held at Ridgewood Country Club in Paramus in 2018, then at Liberty National in 2019 and at Plainfield Country Club in Plainfield in 2020 before returning to Liberty National in 2022. Also in 2022, Trump National Bedminster will host the PGA Championship. Annually, of course, there is golf’s “Jersey Shore Tradition” – the ShopRite LPGA Classic Presented by Acer – which has been a favorite stop on the tour for more than two decades. This year Anna Nordqvist is the two-time defending champion, with competition June 2-4 at Stockton Seaview Hotel and Golf Club in Galloway. Located right across the bridge from Atlantic City, the ShopRite LPGA Classic has produced tremendous drama over the years, with a list of Hall of Fame past champions that includes Annika Sorenstam, Betsy King, Juli Inkster and Se Ri Pak, as well as Karrie Webb, Cristie Kerr and Stacy Lewis. Kerr and Lewis will be among the American favorites in the U.S. Women’s Open, which features a record purse of $5 million. Trump National Bedminster hopes to add another impressive name to its list of national champions – Jordan Speith won the 2009 U.S. Boys’ Amateur Championship at the club’s Old Course. Also during U.S. Women’s Open week, the USGA Golf Museum’s upcoming exhibit, “Breaking New Ground: Women and Golf Course Architecture,” will open in Far Hills. Visitors will learn how golf course design impacts accessibility through stories of late nineteenth-century golf clubs for women, early USGA championships, and female golf course architects and developers. Artifacts and ephemera from the USGA Museum and Library collection, in addition to loans from the United Kingdom, Canada, and local historical archives, will illustrate these new narratives of female leadership, initiative, and innovation. As for the newest innovation to attract the public to the game – TopGolf – is a huge success in Edison, offering golfers and non-golfers a relaxed and entertaining nightclub environment that goes beyond hitting golf balls. While the TopGolf Edison does feature more than 100 climate-controlled hitting bays, the attractions also include a full-service restaurant and several full bars, more than 200 HDTVs, a rooftop terrace with fire pit, private event spaces and free Wi-Fi throughout. For additional information on this summer’s events or places to play, http://www.visitnj.org.